Lockwood Glen is nestled in Franklin, Tennessee, a unique and charming area of Williamson County, located just 20 miles south of downtown Nashville. Lockwood Glen is located just a few minute’s drive from historic downtown Franklin, where you can enjoy coffee shops, bookstores, antique shops, brick sidewalks and troves of Victorian homes and architecture. You can experience the authentic feel of small-town Franklin, TN just a few miles from Lockwood Glen. The quaint downtown is perfect for shopping, dining, biking and strolling. Year-round festivals and cultural events offer something for everyone. Or, take one of the many walking tours available in the area to learn about the Battle of Franklin, the Civil War, or historic ghosts stories from the downtown Franklin area. Lockwood Glen is close to Nashville, yet far enough away to offer a relaxed lifestyle. If you enjoy the outdoors, there are many ways to experience some of Tennessee’s most beautiful scenery. Enjoy the rolling hills of Franklin or stroll alongside a local waterway on the Harpeth River Trail. You can also enjoy one of the many parks in the area, like Bowie Park and Nature Center, located about a half hour’s drive from downtown. 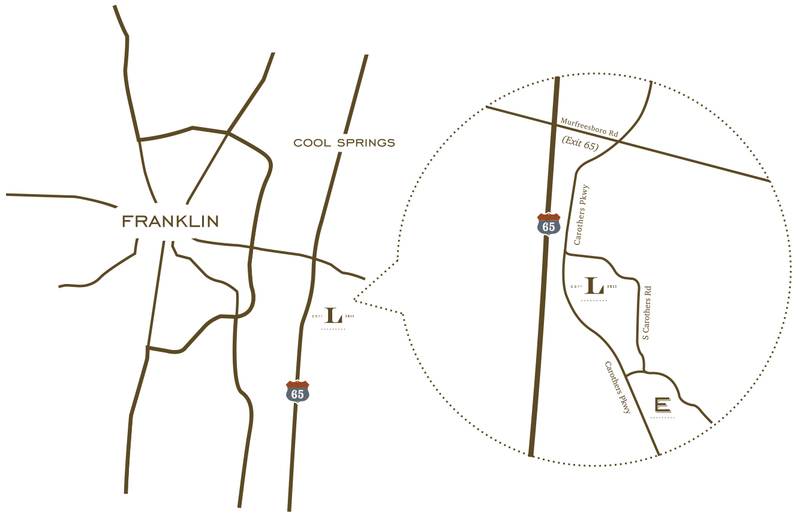 Franklin, Tennessee has several school options, making living at Lockwood Glen so appealing. Residents have the option of enrolling their children in one of the area’s thirteen private schools or in one of the many highly-rated public schools in Franklin. Use the tool above to explore the options and learn more about what school might be best for your family. You can view nearby schools on the map or search by zip code. Please confirm which school your home is zoned for with your home builder and the Williamson County School District or the Franklin County School District. Take I-65 South to exit 65. Turn left to head east on Highway 96 for .2 miles. Turn right onto South Carothers Parkway. Drive 1.9 miles, and Lockwood Glen is on the right.